If you’re anywhere near Chamonix on Sat 7th December and want to appreciate the pain of our June Afghanistan bike trip first hand, then drop by the Vert Hotel bar at 8.30 pm for the next of the now-legendary (and free) Milner slide/film shows. Expect the usual abuse and heckling (from me) while being bombarded with plenty of pics that will instigate “ooohs” (from you) and a couple of pics that will make you glad you weren’t on the trip. No, I haven’t forgotten, despite the recent avalanche of snow-related posts on Svalbard. I still love bikes. So here’s a link to the feature of mine that the very nice people over at Pinkbike have just posted. This one is a tale of us heading to Patagonia, full sus’ bikes in tow to discover what this spectacular region has to offer when you start looking for trails to ride and grabbing shuttles to the trailheads. The revisit came a decade after expedition-style MTB touring there for a year on rigid Kona Cinder Cones with panniers a swaying in the breeze. (“Breeze” is an optimistic term for the Patagonia gales that will happily part you from your bike, depositing your machine in a nearby lake, I add). Read the feature here. And here’s the bike that made that original trip: 1996 Kona Cindercone. A lot changes in a decade. Ahh one look and I can feel the memories (and pain) come flooding back. When it came to choosing a bike for a year around South America back in the mid '90s, there was little discussion. 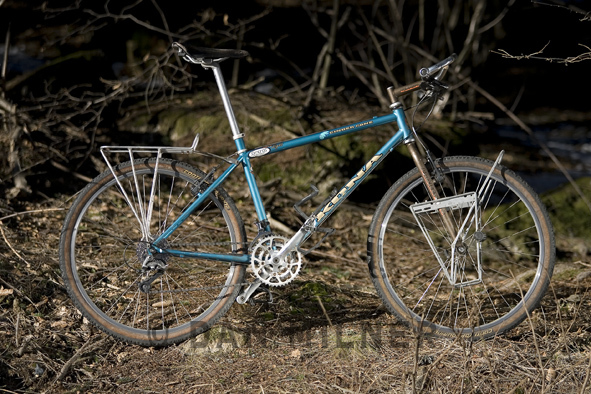 The Kona Cindercone was THE machine back then for these kind of expedition romps. Butted Cro-Mo frame that could be welded anywhere if needed, and light, strong triple butted Project II forks, Canti brakes, front and rear unbreakable Blackburn racks (my rear one broke, halfway down the Carretera Austral in remote southern Chile and I made it out with it held together by zip ties), bar ends, flat pedals with toeclips and 1.25" Conti Top Touring tyres.... but boy look at the length of that stem. Makes my neck hurt just looking at it.